Raisin maakt gebruik van cookies om je de best mogelijke service te bieden. Als je de website blijft gebruiken, stem je in met ons gebruik van cookies. Berlin, April 26th 2016 – Raisin is the first European fintech startup that has reached the incredible amount of 1 billion Euro invested volume. Since Raisin started with its German platform WeltSparen in December 2013 customers have invested more than 1 billion Euro in overnight money and fix-term deposits. Within Europe Raisin´s success is unique, but even compared to the rest of the world, Raisin could be proud of its development. There are only two other startups that have managed to reach this amount in assets: Wealthfront and Betterment, both from the US. “It took Wealthfront also less than 2.5 years to reach $1 billion in assets. We managed to meet this goal in 2 years and 4 months. So we are happy to join this exclusive club of ‘1 billion fintech,” Dr. Tamaz Georgadze, co-founder and CEO of Raisin proudly explains. The amount of 1 billion could be seen as a milestone in the development of a fintech. It could give a reasonable forecast about the future of a fintech. “I could support the experience of Wealthfront that the first billion is even harder to reach than the second”, commented Dr. Tamaz Georgadze. “Wealthfront did the second billion within nine months. As we are convinced that our offer is of high quality and meets the needs of our customers, we are planning to reach the second billion within a year. Under the brand WeltSparen, Raisin GmbH has offered an online marketplace for deposit products of partner banks in the European Economic Area since 2013. 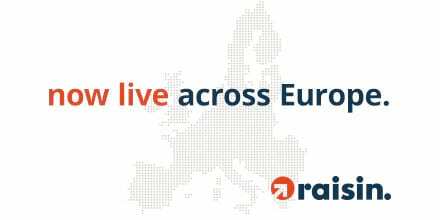 With the launch of Raisin, the platform is now available across Europe. Raisin gives customers the possibility to open deposits at attractive interest rates across Europe free of charge. Previously, customers had to contend with varying, complex account opening procedures in foreign languages, sometimes requiring physical presence in the country. These are no longer a concern with Raisin. All deposits are 100% guaranteed up to €100,000 per saver and bank by each national Deposit Guarantee Scheme in accordance with EU directives. Raisin doesn’t charge any set-up fees and currently offers interest rates of up to 2.2% via its partner banks. Geen spaarrekening gevonden die bij je past? Met de nieuwsbrief houden we je op de hoogte over nieuwe spaarproducten, partnerbanken en bonusacties bij Raisin. Je kunt te allen tijde bezwaar maken tegen het gebruik van je e-mailadres voor reclamedoeleinden. Door op 'Aanmelden' te klikken accepteer je het privacybeleid van Raisin.